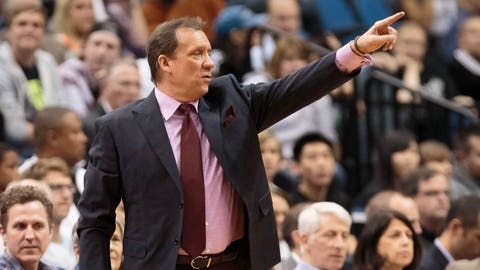 MINNEAPOLIS — Summer was coming into bloom, and Flip Saunders had an extra bounce in his step as he departed Minnesota’s arena with his wife that night of the 2015 draft. The Timberwolves were finally on the verge of flourishing again after so many lost seasons. They took future All-Star center Karl-Anthony Towns with the first overall pick and followed with a trade for hometown point guard Tyus Jones later in the first round. Saunders would surely be smiling about the tribute in his honor at Target Center on Thursday night before Minnesota’s game against the Los Angeles Lakers. There’ll be a permanent banner unveiled prior to tipoff. Auctions of custom sneakers , a special painting and the jerseys worn by the Wolves during the game will raise money for the Flip Saunders Legacy Fund, which was established to support individuals and groups in keeping alive the positive impact of his life . The shoe shop Kickstradomis has worked to make a different pair of sneakers for each Timberwolves player, each inspired by the memory of Saunders. Everyone in attendance will also receive a commemorative coin , in honor of his custom of having a themed keepsake created each season for players and staff. Saunders also used to randomly hand the trinkets out to people he’d meet along the way, in an effort to include fans in the effort and process of each season. Debbie Saunders was sifting through some of the items at home on Wednesday while she spoke on the phone with The Associated Press. The keys, on an oversized jailer-style ring, bore an inscription of five foundations for success: teamwork, confidence, execute, conditioning and compete. Small forward Andrew Wiggins, the first pick in the 2014 draft whom Saunders acquired from Cleveland in the trade that sent Kevin Love to the Cavaliers, still has all of the keepsakes from Saunders. Over 11 different seasons as Minnesota’s head coach, covering two stints, Saunders compiled an overall regular season record of 427-392. He was on the bench for each of the team’s eight straight appearances in the playoffs, the last of which was in 2004 that ended with a Western Conference finals defeat by the Lakers. Fired during the following season, Saunders returned to the organization in 2013 as president of basketball operations and made himself head coach in 2014. Saunders spent three seasons each coaching the Detroit Pistons and Washington Wizards in between his times with the Timberwolves. He died three days before the 2015-16 season opener, about 2 1/2 months after being diagnosed with Hodgkin lymphoma. For Debbie Saunders and her four adult children, including son Ryan Saunders, an assistant coach for the Wolves, the time since his death “has been a tough couple of years.” The family is determined to honor his passions through the foundation, which has assisted programs like summer lunches for low-income children and provided scholarships for kids to attend basketball camps. There will surely be some misty eyes in the arena during the ceremony.